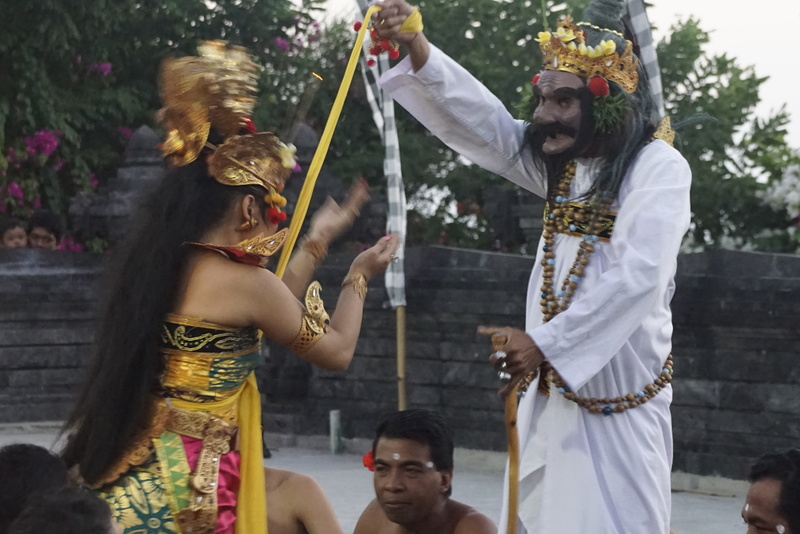 Kecak is a Balinese musical drama, which uses chanting and throat sounds instead of dialogue to depict a story. A group of bare-chested men chant in unison to create the hypnotic rhythms that outline the setting and atmosphere of the narrative. Vivid costumes, masks, and exaggerated movements of the actors help depict the emotions and actions of the characters. Though the performance has no dialogue, the production is enchanting and comprehensible. 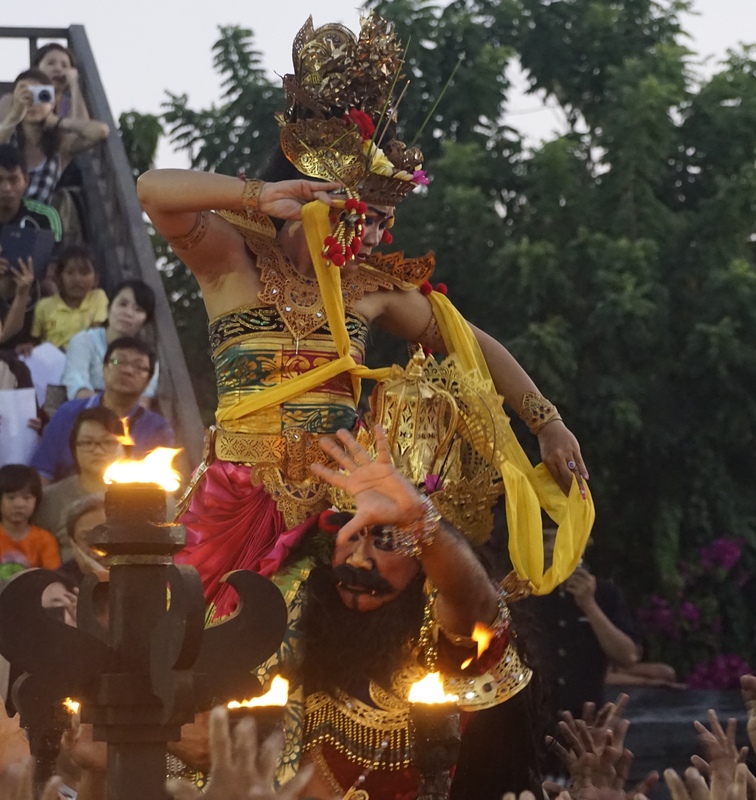 The Kecak drama is an exquisite show that will captivate any audience member. 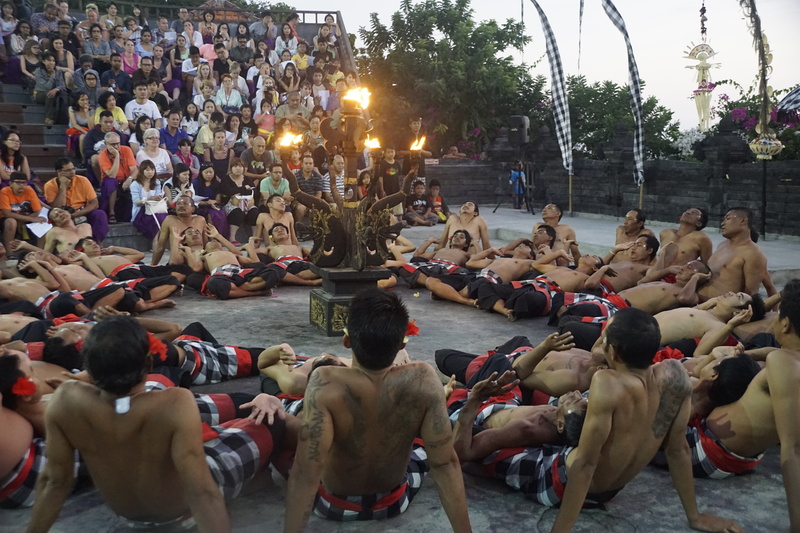 If you are visiting Bali, Indonesia, Uluwatu Temple is one of the locations that you can observe this spectacular performance. 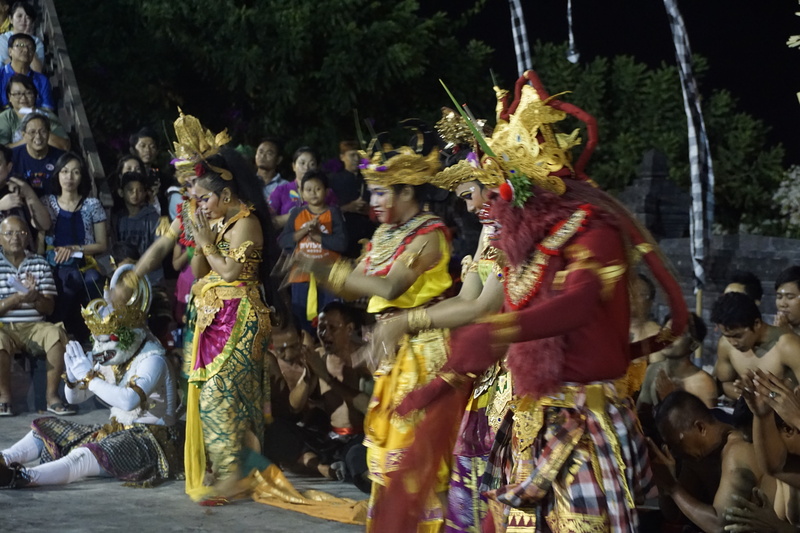 There are also showing in Ubud if you are not traveling to the Kuta area. 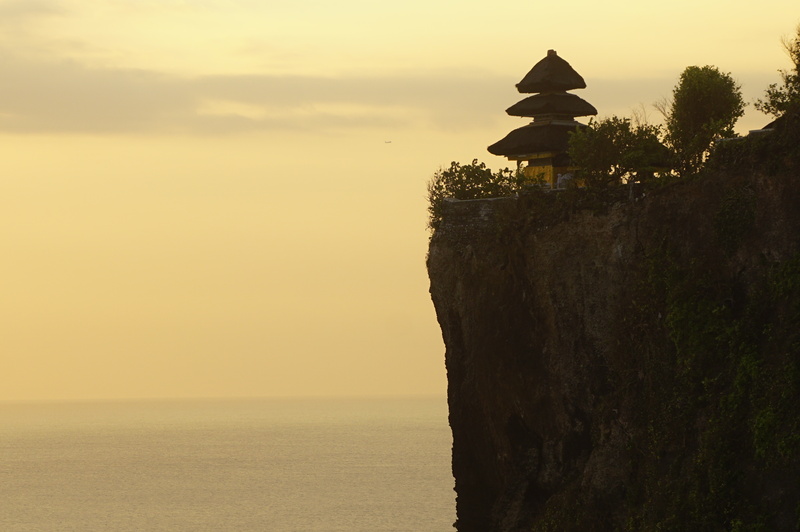 Uluwatu Temple is located in the Pecatu Village in the Southern part of Kuta. 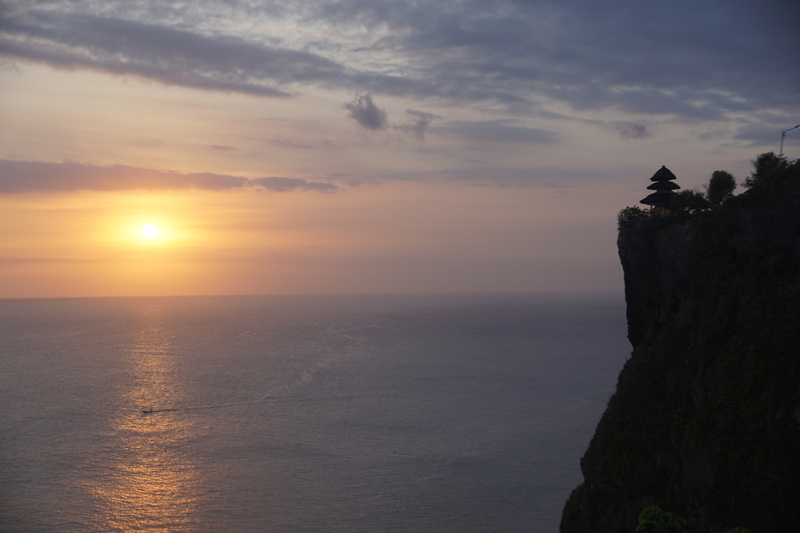 The Cliffside location of this temple provides a magnificent view of the sunset. 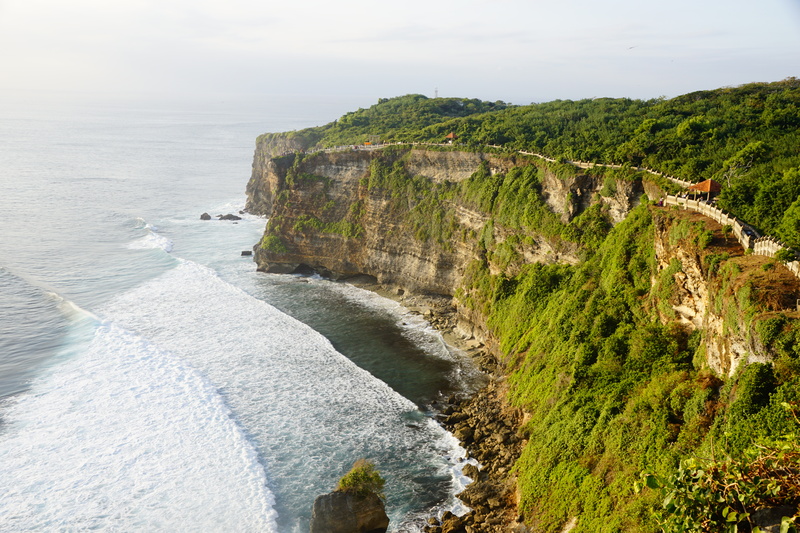 The word “Uluwatu” literally translates to “on top of rock.” The majestic 70 meter cliff is stunning against the turquoise blue Indian Ocean. Uluwatu is also known to have some of the largest surf in the world, so the waves roar into the Cliffside with such ferocious intensity. I arrived to the temple around 4:30pm in order to have some time to explore before catching the performance. When I arrived at the entrance gate, I was provided with a sash to wear around my waist. The temple also provided sarongs, but I did not have to wear one, because I had worn pants. 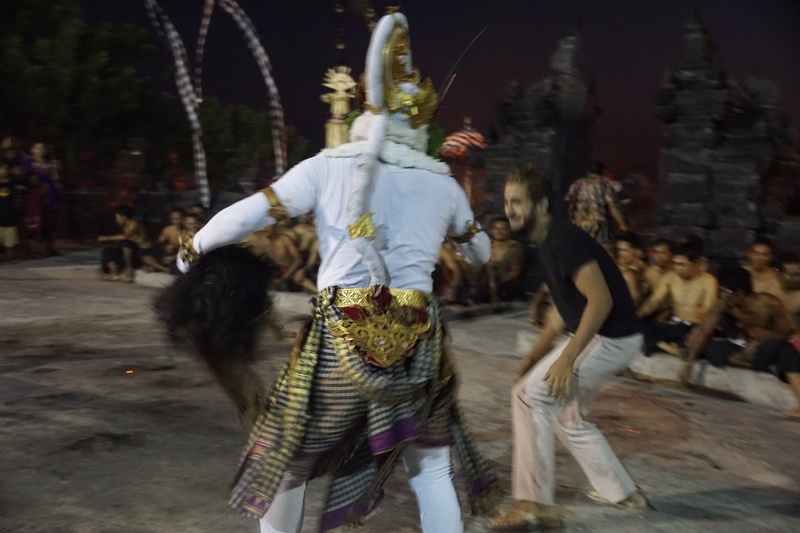 When visiting any temples in Bali, it is important to dress modestly to respect those who are worshiping. Both women and men should cover their legs, and it is best to wear shirts that cover the shoulders and upper part of the arms. Flip-flops and sandals are totally acceptable, as long as the overall look is modest. At the entrance to the temple gate is a small forest filled with monkeys. Make sure to secure your belongings, because these curious and mischievous creatures are known to get away with people’s valuables. 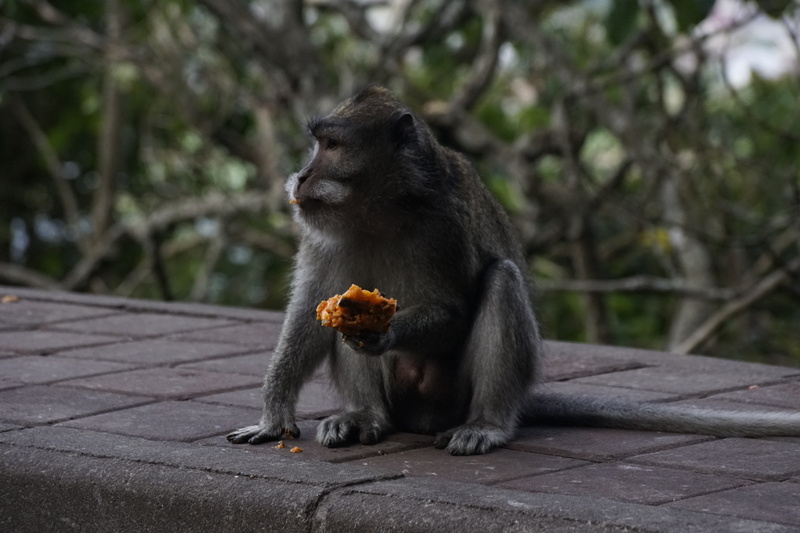 In Bali, the monkeys are believed to guard the temple from bad influences, so guests should do their best to coexist with the monkeys in a reverent fashion. It is okay to take pictures, but do not feed or try to touch the monkeys as they could bite. 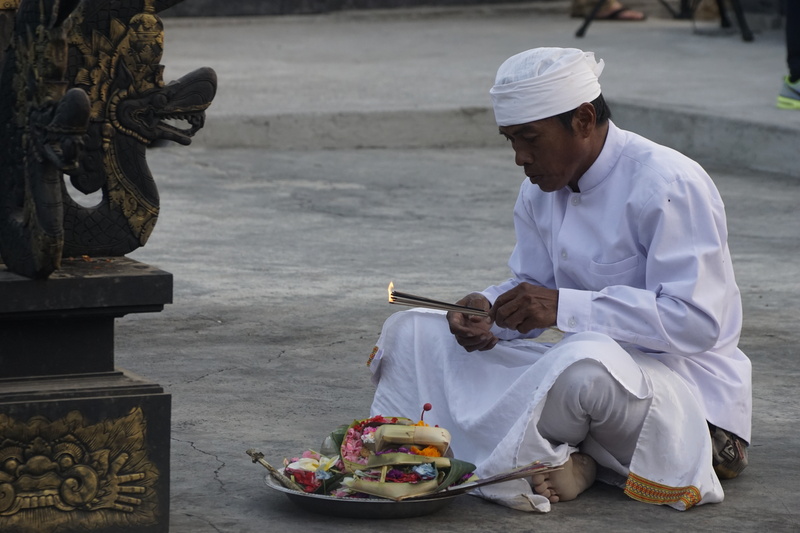 The temple of Uluwatu is used to worship Siva Rudra, the Balinese deity of all elements and aspects of the universe. The temple is also supposed to protect the island from evil sea spirits. The temple and surrounding landscapes are very beautiful, however it can be rather crowded as the sunset approaches. My aunt and I decided that we would rather grab a good seat at the amphitheater instead of fighting the crowds for temple pictures. The keckak dance is performed every evening at 6:00pm just as the sun begins to set. To attend, buy a ticket inside the temple gates. The cost is around 100,000IDR (about $7), and it is best to arrive early, as the seats generally fill up. My aunt and I were lucky to snag two front row seats, which were ideal for picture taking. Also we were able to enjoy the views of the sunset over the ocean as we waited for the show. Just before the show starts a man in white robes comes to light incense and lay out his offering. I curiously watched him as he sat and said his prayers. I really enjoyed his tranquil disposition. After the stage had been blessed, a group of about fifty or sixty men made a grand entrance through the temple gates. The men were dressed in black and white plaid sarongs with a red sash tied around their waist. They all also had a bright red hibiscus flower tucked behind their ears. The men came in shouting in unison saying “cak, cak, cak” in a polyrhythmic chant. The men used different pitches and intensities while moving in a circular direction around the alter. Their melodies were hypnotic and I felt entranced by the vibrations of their singing. I could actually sense my heartbeat beating faster, and my body felt prickly from the energy the chorus was creating. As they moved back and and forth, the group seemed to mimic the energy of the waves hitting the cliffside just below. The chorus of men continued their chanting as three characters dressed in elaborate costumes entered the stage. The three characters were Rama, his beloved bride Sinta, and Rama’s brother, Lakshmana. It was apparent that these were the protagonists of the narrative because their graceful moves portrayed their gentle dispositions. The love for Sinta was expressed by the adoring and passionate expressions from Rama’s face. It was lovely watching them saunter around the chorus of chanting men. In the Hindu story of Ramayana, Sinta is entranced by a beautiful golden deer that has been sent by the evil demon king Ravana. Rama leaves Sinta with his brother to go and fetch the deer for his beloved wife. Later, Sinta thinks that she has heard a cry of distress from Rama, so she begs Lakshimana to go after him. Lakshima does not want to leave Sinta alone, but he also does not want to appear as a coward. Laskshima draws a magic circle on the ground, and begs Sinta to stay in it until he returns with Rama. Sinta, left alone in the forest, becomes vulnerable to the fickle nature of the evil demon king. Ravana disguises himself as an old priest and preys on Sita’s kind nature by begging for food. Sita credulously steps outside of the circle, and she is abruptly abducted by Ravana. Ravana takes Sinta back to his palace and tries his best to seduce her. However, Sinta remains steadfast and loyal to her one true love, Rama. 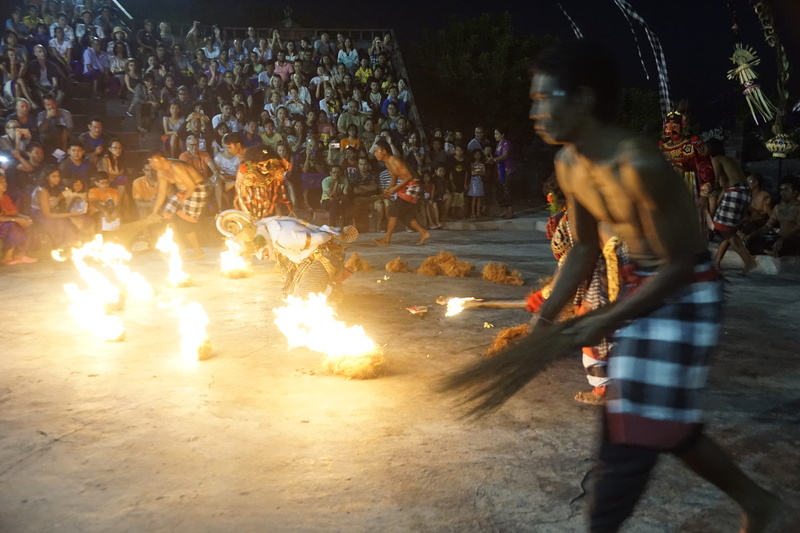 During the Kecak performance the two characters dance around the circle of chanting men. The chorus chants the “cak, cak, cak” at a ferocious intensity to build the tension between the two characters. Simultaneously, the sun has almost finally set, and the darkness contributes to the climatic atmosphere. The only light came from the lit alter at the center of the stage. The dark scenery was metaphoric to the feeling of sadness from Sinta being separated from her darling Rama. Suddenly, an unexpected character entered the amphitheater. Hanuman, the infamous monkey god, had come to Sinta’s aid. Hanuman first appeared climbing the temple walls that were surrounding the stage. It was quite a surprise, because he seemed to appear out of nowhere! Though his mission was to save Sinta, his monkey nature provoked him to to act curiously and interact with the crowd. He climbed through the seats and fooled around with the audience. He took off hats from onlookers heads, and sneakily snuck up on patrons. It was a riot, and I thoroughly enjoyed the comic relief. Sita sends Hanuman back to Rama with her hairpin, so he can know that she is still alive. Hunaman gathers his monkey army, and with the aid of the bird king, Garuda, they all fight Rahwana and save the princess. 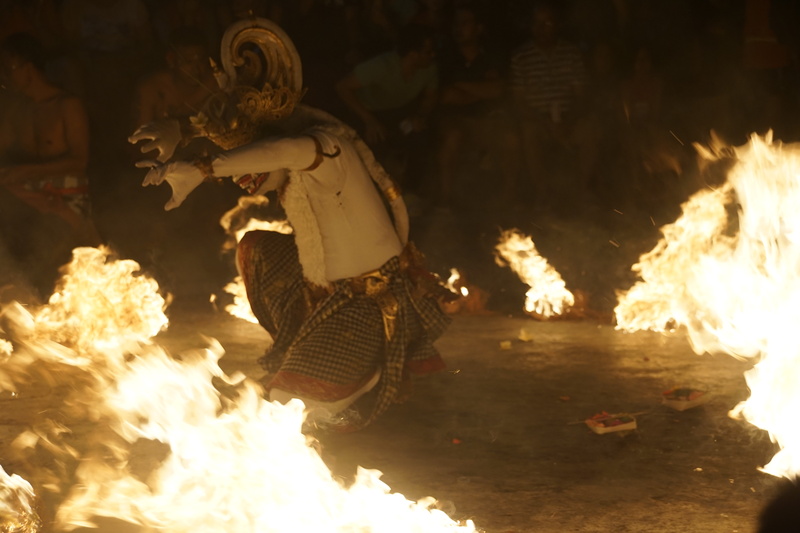 The Kecak performance ends with a fiery battle between Hanuman and Ravana. The chorus of men trap Hanuman in a ring of fire while never ceasing their mesmeric mantra. I eagerly sat on the edge of my seat as the plot reached the climax. I truly hoped that good would triumph evil. The story concludes with the defeat of Ravana. Hanuman escapes the ring of fire and Sinta is reunited with Rama. Before the characters exit the stage, Hanuman brings some audience members to the stage for some more merriment and amusement. He finally exits the stage the same way he arrived, by climbing on the temple walls. Finally the other characters come out for a final dance before taking their bow. 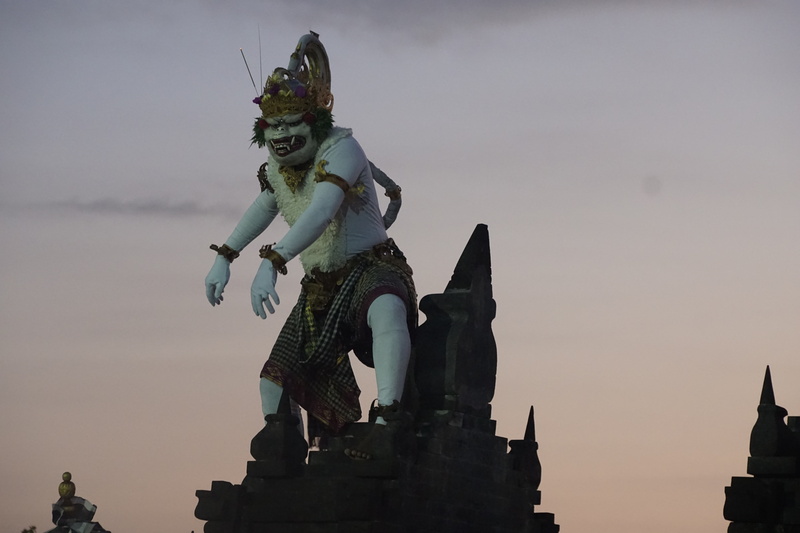 Though everyone comes to Bali for a different reason, one aspect everyone can appreciate is the Kecak drama. 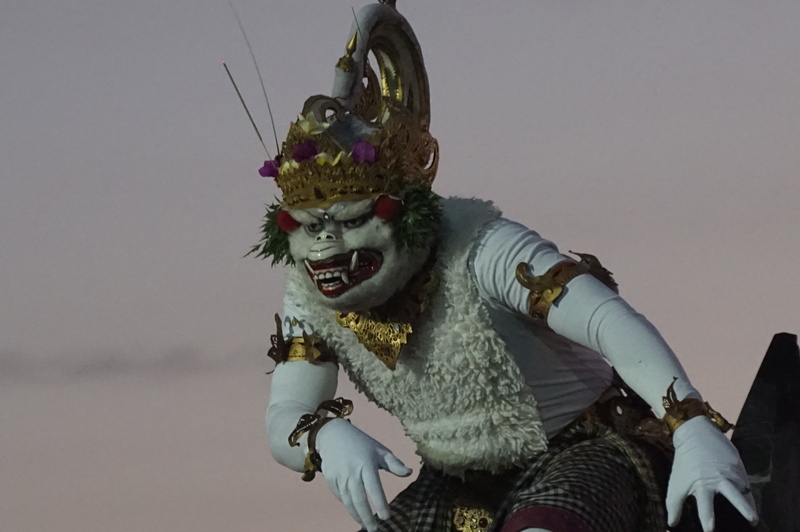 The simplistic, yet marvelous production offers a glance into Balinese life. One can not help but be entranced by the driving energy of the chanting chorus. The exquisite costumes and aesthetic movements of the actors are truly mesmerizing. 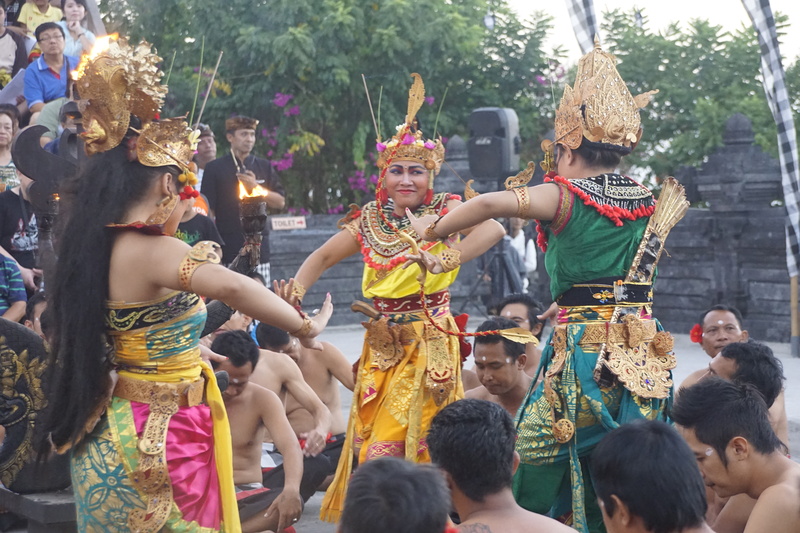 If you are visiting Uluwatu, do not miss this spectacular performance! Your best yet, and great photos too.